Today Missouri voters are at the polls in a referendum to repeal the state’s “right-to-work” law, thanks to the heroic efforts of union members and allies who gathered 310,657 signatures last year to block implementation of the anti-union law until voters could decide. Legislative Republicans pushed the referendum date back to August, instead of the November ballot, to suppress turnout. Shannon Duffy is one of many unionists in Missouri who’s been out knocking on doors this summer to get out the vote. –Eds. There’s been a lot of talk about the value of unions online and on doors this election season, and I’d like to address two questions that continue to be voiced. Let’s forget for a moment that it’s not a good idea to equate being in a union to being in a country club (it doesn’t exactly push back against that elitist tag that they always try to pin on us) or that substituting “homeowners association” for “country club” when talking to people on the lower end of the socioeconomic ladder isn’t really any better. No matter how you slice it, it’s still those of us who have lecturing those who don’t have about why the system shouldn’t be changed, and that’s not exactly a winning strategy. Imagine you’re walking down a hall and you pass three rooms. Each room has a group of people sitting around a table. The group in the first room is well-dressed, sitting upright and alert in their seats while having a discussion. The people in the second room are dressed nice, but more casually, and they seem relaxed. The third group is decked out in T-shirts and jeans, and they are having an argument. To which group would you rather belong? If you’re a member of a labor union, which group do you think best exemplifies your union? And, finally, if you were under attack, which group do you think would race to your side to stand with you? I should warn you that, this being an allegory, things are not always what they seem (neither are unions). If you picked to belong to the first group, you’re going to be disappointed. The table they're seated at is a conference table, and it’s a group of people at work. They may or may not be friends with each other and it’s anyone’s guess if they’d help you if you were in a jam. One or two of them may lend you a few bucks till payday if you asked, but they sure as hell wouldn’t cosign on a loan if you needed it. They’re only at that table because they are being paid to be there; theirs is a strictly transactional relationship. And, believe it or not, this is the example many of us choose to explain unions to those who are not in a union. We describe the union as an unfeeling thing, like a vending machine. We put our money in and out comes a retirement plan, more vacation days, etc. Our relationship with the union—and with one another—is strictly transactional. Perhaps you picked the second group. They are a group of friends in a restaurant having dinner. They’ve known each other for years, one or two, perhaps, since grade school. If you belonged to this group, these would be people who know you well and would be there if you needed help (one or two might cosign on that loan you need). But still, there are limits to what you could expect from them. If you chose to join the slovenly-dressed group shouting at one other, congratulations, because this last group is a family sitting around a kitchen table. Of all the groups, these are the people who would know you best. Sure, you argue—but you also know that, if you needed help from any one of them, they would be there in an instant. Cosign on a loan? Hell, these people would give you a kidney if you needed one. Their commitment to your well-being has nothing to do with reciprocity. They will always be there for you, no matter what, and would sacrifice just about anything for you. So why, when we’re talking to those not in unions, do we describe what it’s like to be in a union as belonging to the group behind door number one and not door number three? Do we honestly believe that’s the best way to persuade others to vote against right to work? Or perhaps it’s because that’s how we actually perceive our unions. Back in the eighties, when I was a Machinists (IAM) steward at Ozark Air Lines, a co-worker was suspended for three days without pay over something that was understood by everyone to be totally arbitrary and unfair. A grievance was promptly filed, but the union knew that the process would take months to resolve and that, in this case, justice delayed meant justice denied. Our co-worker was going to be seriously short on his next paycheck and winning the grievance and getting him his money back could take almost a year. Help was needed now. So there we were, being really safe and doing everything by the book. Everybody was mindful of how they moved, looking where they walked and traffic was moving at or below the posted speed limit of 15 MPH. In a short period of time, flights started to back up. After a few hours, it affected the afternoon and evening schedules, because flights waiting to depart for cities like Denver and San Diego return later in the day and then depart again for other destinations. But planes kept sitting on the ground in STL and everything just kept backing up. Flights would arrive and then spend an incredibly long time waiting for gates. The terminal was packed with irate passengers. Meanwhile, union workers kept paying careful attention to how they picked up a bag or piece of mail or freight and management started to lose its mind. The younger, junior member of our Grievance Committee walked outside on the ramp and people gathered around him. He looked around to make sure no supervisors were near, smiled, and said four words: “It’s working. Go slower.” And everyone nodded and went back to doing what they had been doing before. It soon became clear that management had no clue about how to deal with the Safety Campaign or how to stop it. Over on the B-concourse, a senior member of management approached a group of workers who were behaving very safely and he began screaming at them. He yelled and cursed and said that, unless they started moving faster, they would all be fired. Their response? They smiled at him and went right on being safe and conscientious workers. Flecks of spittle were flying out of his mouth as he bellowed. Someone laughed and said, “He’s foaming at the mouth!” When no one did as he commanded, he staggered over to the steel pier that held up the jetway and leaned heavily against it. He seemed to be trying to catch his breath, and more than one person thought he might very well expire right on that spot. However, he caught his second wind when he spied a bag runner pulling three or four carts of bags, crossing from the C-concourse to the B and only going about two miles an hour. He stopped the driver and demanded to know why he was driving so ridiculously slow. The driver said, “It hurts to go any faster.” It was a great reply because there was ice on the ground and driving over it was bumpy as hell and it did hurt if you went very fast. That had never mattered before; we all drove over that stuff really fast all the time. But it was still a great reply because no one could claim that it didn’t hurt. I believe the driver may also have said something logical, like how driving too fast over all those bumps might cause bags to fall out. In any event, the manager said nothing, walked dejectedly back to his vehicle, and drove away. Scenes like that were being repeated all over the airport that day. At three o’clock our Grievance Committee was called upstairs again. This time, they were informed that our suspended brother would be paid for the three days he had missed and the letter of discipline would be removed from his file. So would they please go back downstairs and get the workers to stop what they were doing? It is not an exaggeration to say it was one of the best days of my life. To answer that, it’s important to understand how a workplace can be a source of great strength. An active union presence in the workplace is often the basis for other, perhaps larger, mobilizations that occur outside the workplace and in the community. When strong unions forge coalitions with other social movements, there is enormous potential for change. An organized and mobilized workforce is capable of all kinds of mayhem and of creating all kinds of change—and that is what scares them to death. I witnessed it firsthand at Gate 18-B back in the eighties. It’s why those in power have waged a relentless campaign against us all these years. The idea of workers realizing how we are all connected scares the bejesus out of them. This has never been about workers receiving an extra 25 cents an hour or a 401k match. That’s small potatoes to them, an annoyance. This is the result of planning on a grand scale. 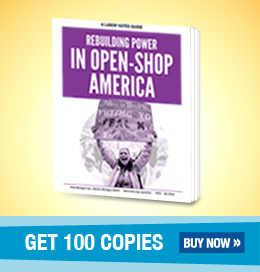 It has to do with keeping workers disorganized and, if possible, at each other’s throats—because a disorganized workplace, where workers feel powerless, prevents our ability to act collectively in the broader struggle for social and economic justice. So to conclude: When describing unions, pick door number three. Talk about our movement in the broadest terms possible. Explaining movement-building might be difficult at times, what with all the arguing that sometimes goes on in our “family,” but when workers are marching together, nothing can stop us. And I mean all of us. Shannon Duffy is a business representative with the United Media Guild (CWA) in St. Louis, Missouri.